I recently went to mount a new security camera. I configured it for the network, hooked it up to my POE switch, and pulled out my ladder to evaluate the mount position. As I put it into a notional spot I quickly realized while watching the video stream that the camera just was not capturing as much of the area that I needed. The reason? The field of view (FOV) was a little smaller than I expected. A camera’s field of view is based on the focal length of the lens, which is the distance of the lens to the imaging sensor, and the imagining sensor size. This focal length is represented in millimeters (mm). The smaller the distance, the wider the field of view. The larger the distance, the more narrow (think tunnel vision) the view. The smaller the FOV, see close up and wide. The larger the FOV, view something at a distance. 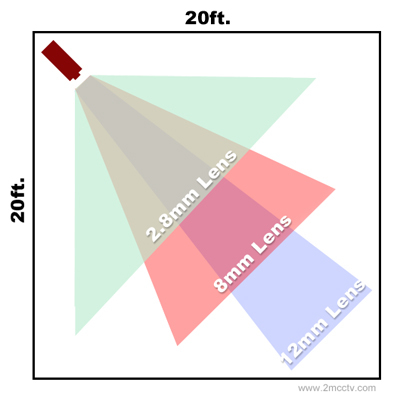 Since most surveillance cameras use a 1/3″ sensor, this chart can be used to quickly reference FOV and image area. You can also quickly calculate different focal lengths and see example output at IP Video Market or Polaris USA. The camera I was looking at mounting has a focal length of 3.6mm, resulting in a horizontal field of view of around 67°. Based on the mount location and the size of area to be imaged I really need a camera with a FOV as close to 90° as I can get. Which means I need a camera with a sub 3mm focal length. One last consideration. Keep in mind that the larger the area being imaged, the lower the amount of resolution available to image specific areas in the field of view.